Aberdeen based 10ft Tall Theatre brings the miraculous true tale of a troubled man�s struggle at sea to theatres across the North East of Scotland. The Deep is set in 1999 where a young fisherman finds his ship sinking. 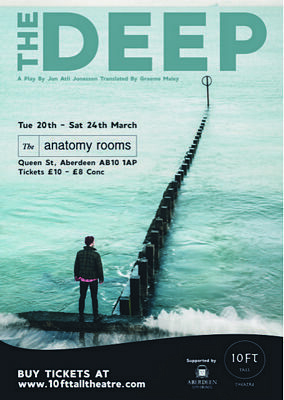 Graeme Maley�s adaptation of The Deep is steeped in the heritage of the North East fishing communities whilst bringing a beautiful and universal story of love in adversity. Using live music, this one-man monologue offers a compelling and unforgettable confrontation of what becomes important and relevant when lost at sea. The Deep was originally written by Jon Atli Jonasson, based on a miraculous true ocean event off the coast of Iceland. Joyce McMillan, theatre critic of The Scotsman, described The Deep as moving "�brilliantly from the absurdity of life to the pain of losing it, from the trivial to the most profound." The Deep tours Aberdeen and Aberdeenshire from the 15th-25th March 2018. 10ft Tall Theatre is an Aberdeen based theatre company dedicated to bringing quality and unique theatrical experiences to audiences in the North East of Scotland. It was formed in Winter 2016 and they have since shared their work with nearly 2,000 people from across the Shire.